Everyone could use knowledge in how to efficiently and effectively solve problems, no matter what your professional or personal situation may be. Solution-based thinking involves the ability to identify, assess and act upon issues that arise in your life. Unfortunately, many of us are lacking the skills to be able to tackle this process well. However, like most skills, problem-solving can be learned and improved upon. Teach your readers about what problem-solving is along with an easy process they can implement into their lives and more over the next 30 days. Our 30 Days of Problem Solving is designed for you to grow your list and inspire activity in your community. In the content you share helpful tips and advice and to go along with it, emails go out each day that point readers to the new content and challenge them to follow along. With this content bundle, you challenge your readers to become better at problem solving over the course of a month. This PLR Bundle includes 30 articles and 30 email messages. Just copy and paste and you're good to go. Do You Know What Your Problem Really Is? Problem Solving Skills: Who’s The Best Person For The Job? Are You The Right Person To Solve This Problem? Custom written social media posts that go hand-in-hand with each of the articles. Use them to whip up quick Facebook posts, schedule tweets for your posts, or consider combining these little text blurbs with images for your posts and use them on Pinterest or Instagram. No matter how you use them, these social media posts make promoting your content as easy as pie. The posts or articles are a good mix of tips and ideas that will inspire your readers to become more content. There are inspirational posts and those with strategies that your readers can take action on right away. It's a good mix of content that your audience will enjoy. Since the articles also go up on your blog and can be shared via social media, this is a great way to grow your reach and attract new readers. This could be a free challenge to help you build your list and grow engagement with your readers, or it could be a paid product for a life or business coach. The content could also easily be turned into a 30-day group coaching program on becoming better at solving problems. Post each article on your blog to drive traffic there, or if you prefer, share the tips (or excerpts) on your Facebook page to drive up engagement there. Along the way, you can, of course, monetize your emails with suggestions for different books, courses and tools. If you know how to copy and paste, you can set up this 30 days of pre-written content all about becoming more content. Keep it free or make it a paid product. What If Blogging Isn’t Your Thing? Not a problem! We’ve compiled the content into a meaty 30 chapter eBook that you can share with your target audience. Use it as an up-sell or bonus for signing up to your list or coaching program. Turn it into a new paid product to build out your funnel, or post the articles on your site with a call to action at the end to sign up to receive the full content package. You get top-notch self-help content that you can quickly customize for your specific target audience and share with them in a variety of different ways. We even include a guide with plenty of ideas to get you started. The only way you won’t benefit and profit from this content is if you let it collect virtual dust on your hard drive. We put together a “how-to” guide to help you implement this PLR and use it to grow your list. Use it for this challenge, but also for any other 15 or 30 day email challenges you may want to run down the road. We've even included a section on how to write the content for your challenge yourself. We share everything we do to run and promote these 30 day challenges and grow our lists fast. Frankly this bonus alone is well worth the price of the entire PLR bundle. To recap, you’ll get the full 30 articles as a word document, txt files, and the article content turned into a meaty eBook that you can share as part of the content series, or use as a stand-alone product. You’ll also receive 30 email messages to promote the blog posts. 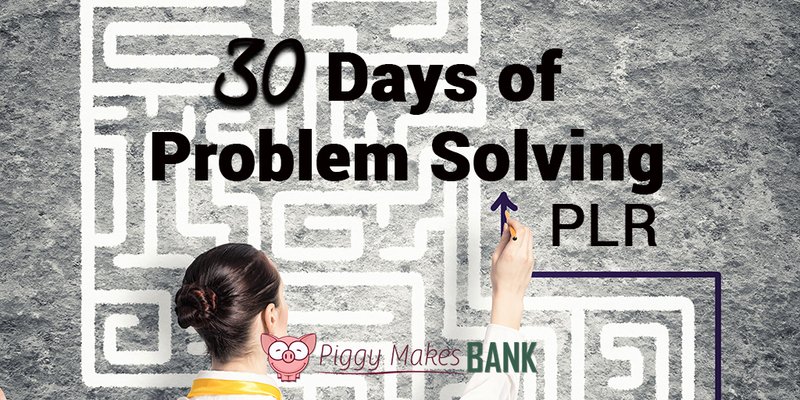 Get this 30 Days of Pre-Written Content About Problem Solving. Perfect for Creating a Community Challenge PLUS BONUSES for just $47 – and Start Growing Your List Today! 30 Days of “Done for You” Content to help you grow your list & inspire activity in your community.